Break the eggs into a jug, season and add a dash of cold water. Beat well. Arrange the outer leaves of the chicory on plates. Quarter the hearts and add these, too. Quarter and deseed the tomatoes, then cut into cubes. Scatter these and the red onion over the chicory. Combine the olive oil, vinegar, garlic, sugar and mustard. Season and sprinkle over the salad. Heat an omelette pan over a high heat with a quarter of the butter and oil until it sizzles, then goes quiet. Add a quarter of the beaten egg and cook, lifting the sides of the mixture with a spatula so that the raw egg runs underneath, and drawing the cooked egg towards the centre. When the underside is golden (after about 90 seconds) and the top is still fairly runny, sprinkle on a quarter of the herbs. 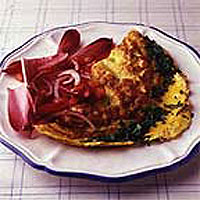 Fold the omelette, then slide it out of the pan on to one of the salad plates. Repeat with the remaining egg to make 4 omelettes. Breakfast: Fresh fruit salad with low-fat bio yogurt; wholemeal toast. Lunch: Tuna and pasta salad. Protein: 22g; Carbohydrate: 3g; Fibre: 0.5g.